Wn69 Saint-Laurent-sur-Mer, K.V.U. Gruppe Percee, Normandie. Set 1kilometer behind the beach was a battery of 3 x 10 Wurfgerät 41, 15cm Nebelwerfer rocket launchers. Laid out in three groups of ten, set into depressions in the ground and aligned to reach the foreshore. Fired by a hand held electrical generator. Fired by a hand held electrical generator. The Wurfgerät were placed in wooden crates to cheapen up manufacture and these were rudimentary aimed by line of sight and angle. 1 x 10 Wurfgerät 41, 15cm Nebelwerfer rocket launchers. 1 x Bunker command post for 10.Gren.Rgt.726. The white lines are the routes of command cables dug into the ground, these were often hit by the shore bombardment and the cables cut. Set in trenches and pointed at the beach. Piles of wooden boxes after sustained firing in the streets of Berlin. Armoured command cable, one I found many years ago.. The holes where the rockets were placed in used by the Americans for slit trenches by the looks of it.. The German defence map of the area showing Wn69 set back from the beach. 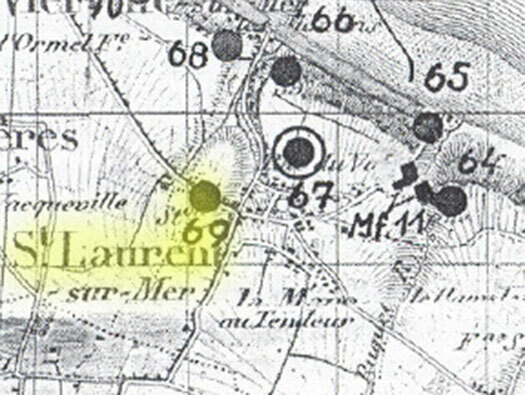 A Bigot map of Saint-Laurent with some details that they think was there. The xxxx barbed wire, T the telephone lines, possibly 6 bays for MT (motor transport) and hedges cleared to allow better fields of fire. 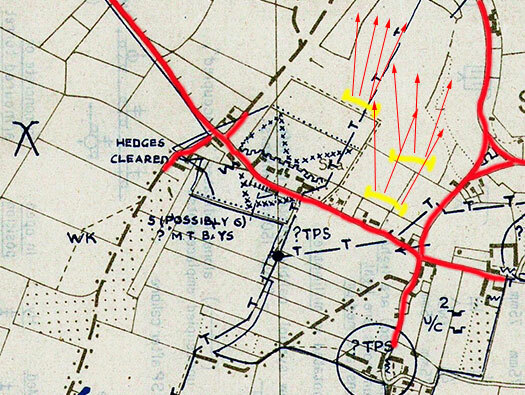 I have added the yellow lines to show their positions and red arrows of direction of firing. This is the fields behind Saint-Laurent-sur-Mer, not the actual field because there are now houses built on the original site. But it gives a good idea how the fields looked. 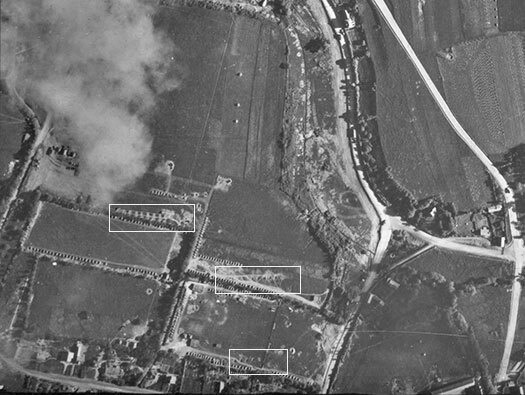 A 1945 air photo of the fields behind Saint-Laurent-sur-Mer and the holes for the rocket launchers have been filled in by the Americans and show up quite well. The Americans used the whole area as dispersed storage for ammunition/food/fuel/medical supplies. 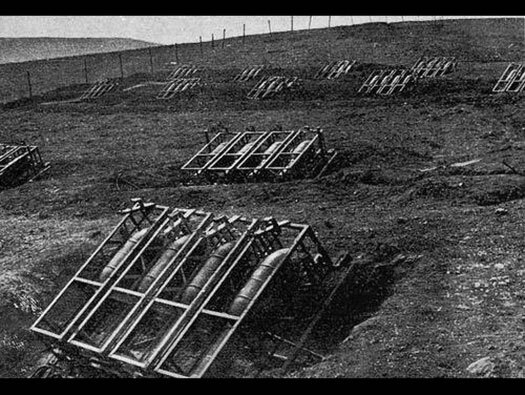 Another batterie site (Not here), sets of rockets and these are in metal launch cages. Piles of wooden boxes discarded from a firing position in Berlin later in the fighting. Maximum rate of fire: 6 Rockets in 10 seconds or 3 salvoes in 5 minutes. The electrical firing device. By twisting the handle quite fast it creates an electrical impulse which fires the rocket. Here at Wn69, a few rockets were fired and caused a great deal of worry to the troops landing but due to the bombing/shelling in the morning a lot of the wire connectors were damaged so very few were fired. 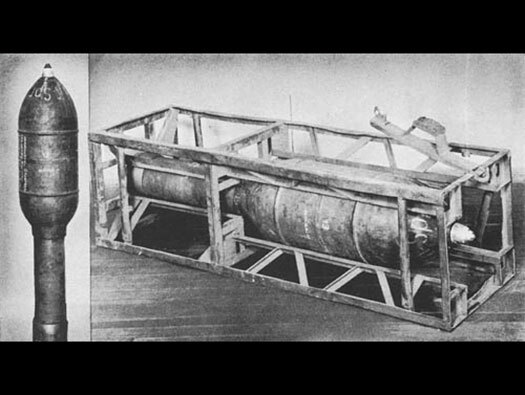 Wurfgerät 41, 15cm Nebelwerfer rocket. The Americans started to push inland in small groups and before they could sort themselves out, they were hit by heavy machine gun fire. Also they came over a grass cliff and straight into Bocage, something they were not trained or ready for. I. L. & K. Co/116 in the afternoon arrived opposite Wn69. 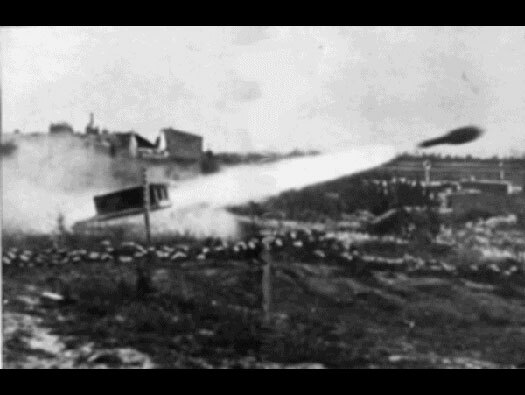 Saw the Germans gunners firing and so ordered their mortars to fire on the German gunners who were then seen running into trenches. The three Co´s were held there for at least three hours under dreadful machine gun fire from well made positions that had caught them cold. An order came for them to move to their left and off the hill into Moulins Draw, which they did and managed to get away from the deadly fire. 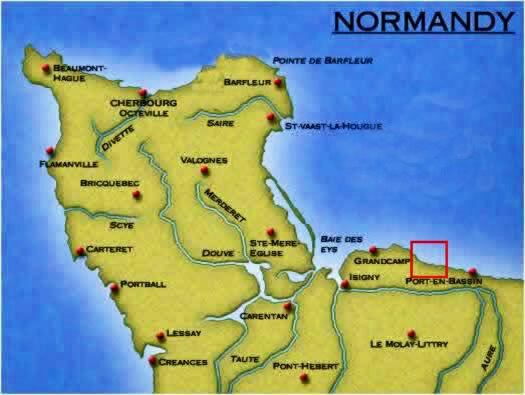 Major Bingham started moving east as he had been landed to far west and came up the cliff and made a left hook intending to attack Saint-Laurent-sur-Mer from the south but as Co´s of the 115th & 116th were between him and the village, he went further south. 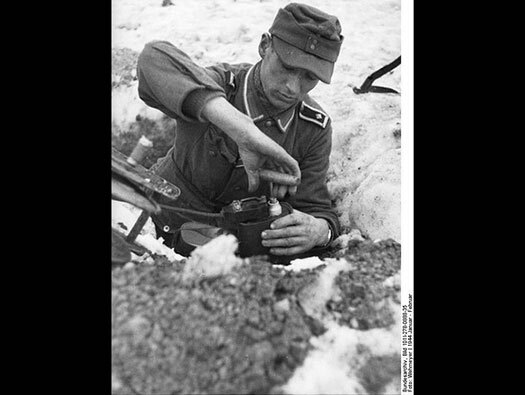 A member of E Co/116 managed to get a machine gun to fire on the Nebelwerfer's and possibly the propellant was hit and a massive explosion took place, which cleared away several gunners. The 115th were supposed to land nu-aposed and walk inland through the 116ths lines. 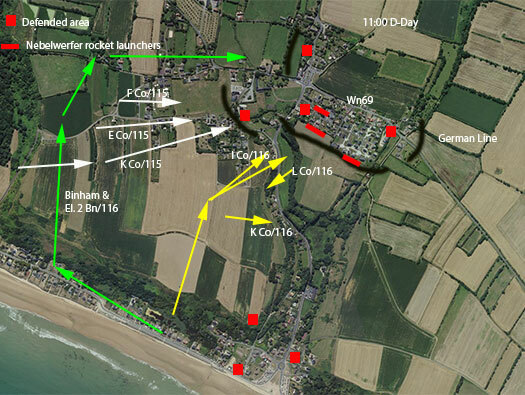 But due to the fact the 116th were still fighting off the beach, their roll was changed to that of attacking Saint-Laurent. The 115th took a route across country through very heavily wooded areas and came into Saint-Laurent from the east side. The church had a stout stone wall around it and was almost made for defence. A machine gun was in the tower as well. Many of the surrounding houses were also fortified. The 115th did not stand a chance. 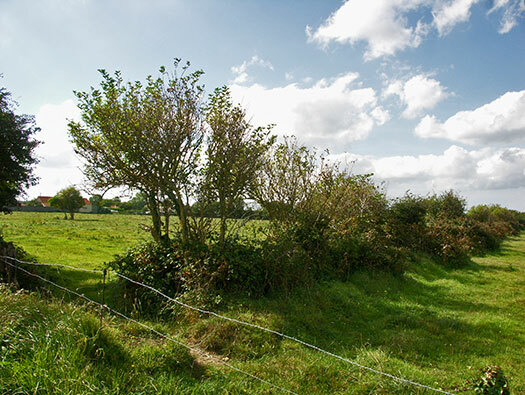 There were trenches leading all over the place, tunnels under hedge rows and protective dugouts. Snipers could move around freely. A member of the Joint Assault Signals Company, noticed the machine gun in the church tower and called in the USS Thompson to shoot it out. Their very first round struck the tower and the machine gunner. K Co/115 had the help later of a Sherman tank from the 741st Tank Battalion, it tried to get into the village but found there was/may have been an anti-tank gun there. Later an M7 Priest 105mm self propelled howitzer came up to support the infantry and fired on houses held by the enemy. To their great pleasure K Co/155 watched as the Germans holding the houses, started to tumble out of windows and doors to get away from the firing of the Priest. USS Thompson hitting the church tower at Saint-Laurent. 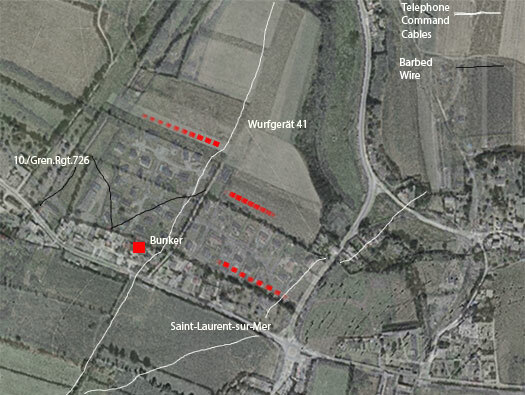 Gradually Saint-Laurent-sur-Mer was taken and it cut off any chance of Germans who were north of the village to escape. The troops holding the village gradually died or retreated. But no reinforcements came. Where as the Americans kept pouring in. Now there was very little fire from the bluffs and Wn defences and the mortars and Nebelwerfer´s were silenced, it was only the batteries that had ammunition to the south could continue firing. Sherman of the 741st Tank Battalion.